I’m fairly new to the world of pressure cooking. I’ve become a fast fan of my Breville Fast Slow Pro! As a working mama with three meals to get on the table every day, this handy dandy appliance takes prep and cook times down to under 15 minutes. It’s my secret weapon on busy evenings or on nights when I’m working late. 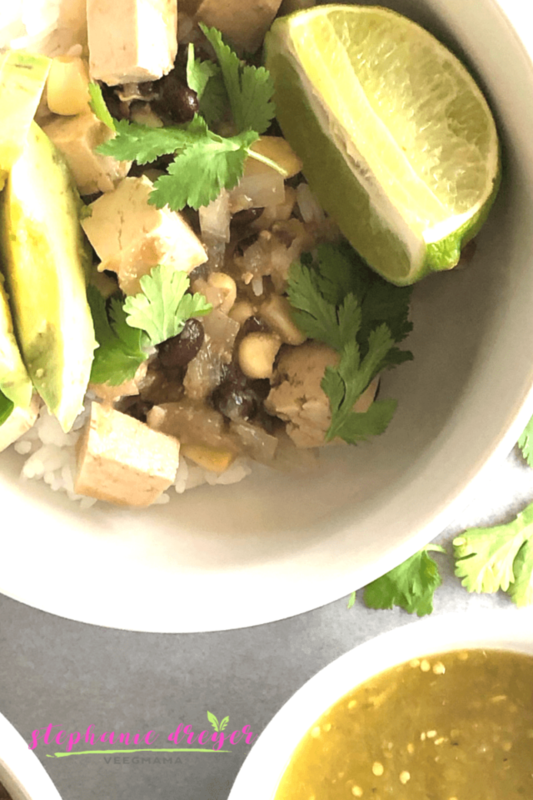 This Tofu Salsa Verde can be on the table in minutes! I love the tangy goodness of tomatillos so salsa verde is one of my favorites. 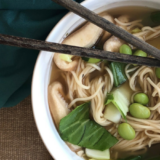 The super firm tofu from Trader Joe’s is perfect for this recipe. If you want things a little soupier, add another 1/2 cup of salsa or don’t drain your beans. I like to serve this with tortilla chips to scoop everything out of the bowl. Enjoy! Cube the tofu into bite-sized pieces. Add olive oil, onion, garlic, spices, broth, salsa, beans, corn, rice, lime juice and zest to the pressure cooker. Cook on high pressure for 5 minutes, then do a quick release of the pressure. It will take about 10-15 minutes to come to pressure, then 5 minutes to cook. Remove lid and let rest for 5 minutes. 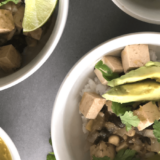 Divide among bowls and top with cilantro, avocado and lime wedges. I love lettuce wraps! They surround flavorful fillings with lots of crunch while adding tons of veggie power. And if you’re counting calories, you don’t have to count the number of wraps you’re eating! 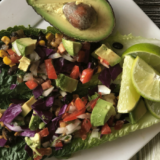 These Black Bean & Corn Romaine Tacos are a tortilla-less twist on my Taco Tuesday standby. The filling is a simple saute of black beans, onions and corn. 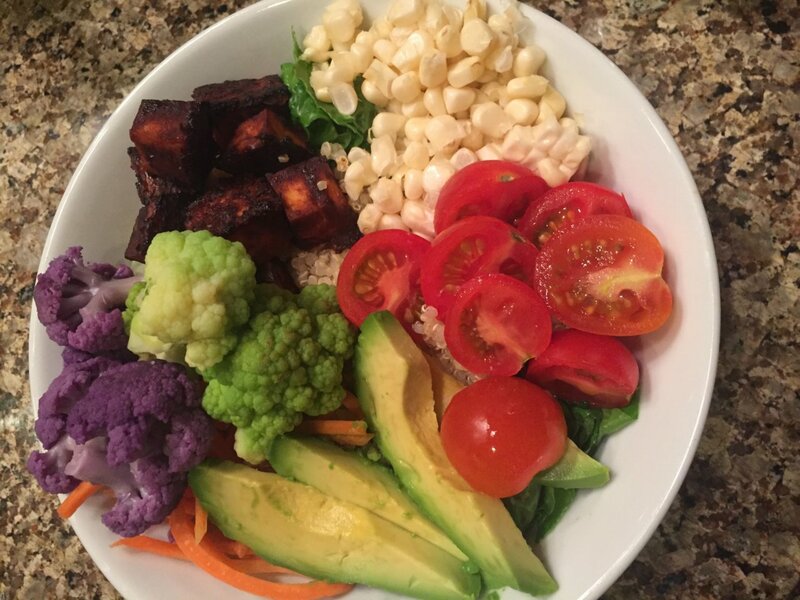 I topped it with my favorite pico de gallo, red cabbage for more color, and of course lots of chopped avocado! I serve it with additional lime wedges. (The more lime, the better in my book!). 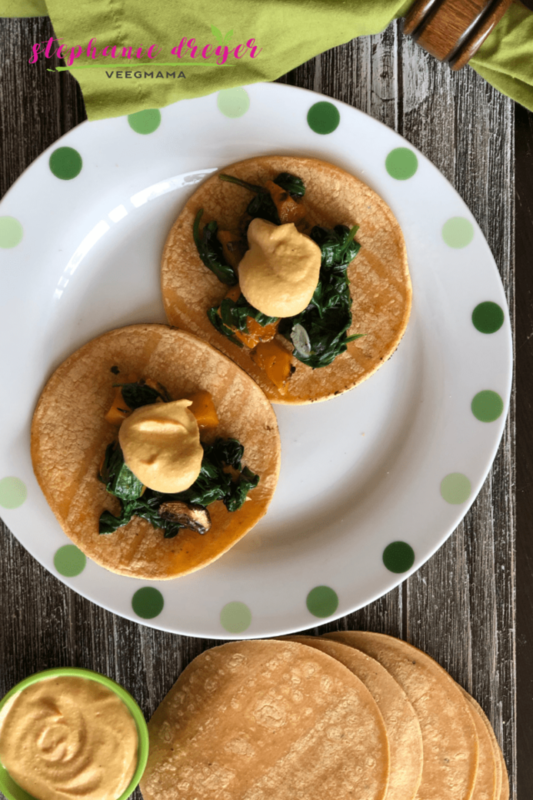 I hope you enjoy this veg-tastic taco alternative. Tag me if you make it (#veegmama). I love to see you cooking my recipes! Saute the onion in 1 Tbsp of olive oil for 3 minutes until translucent. Add the beans, corn and taco seasoning. Cook for 5 minutes until heated through. 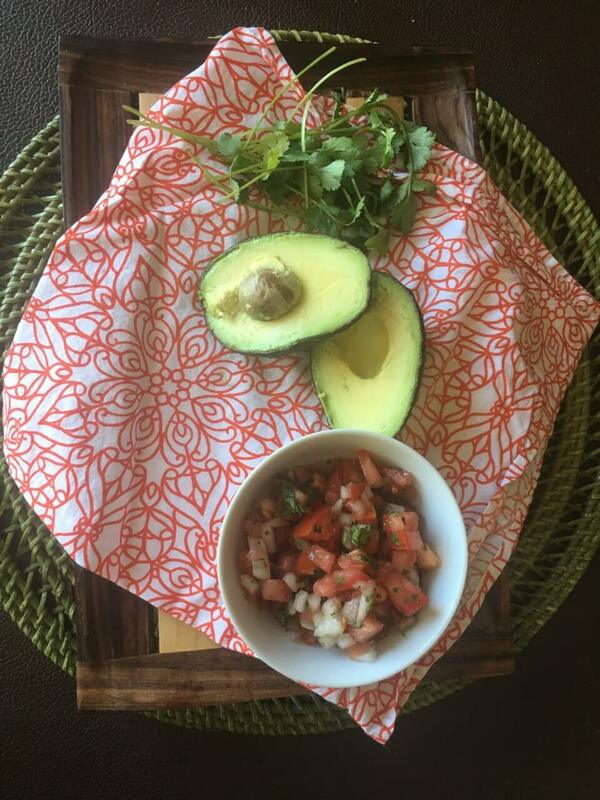 Combine all of the ingredients for the pico de gallo in a bowl. Set aside. Spoon 3 Tbsp of filling into a romaine leaf. Top with the cabbage, pico de gallo, and avocado. 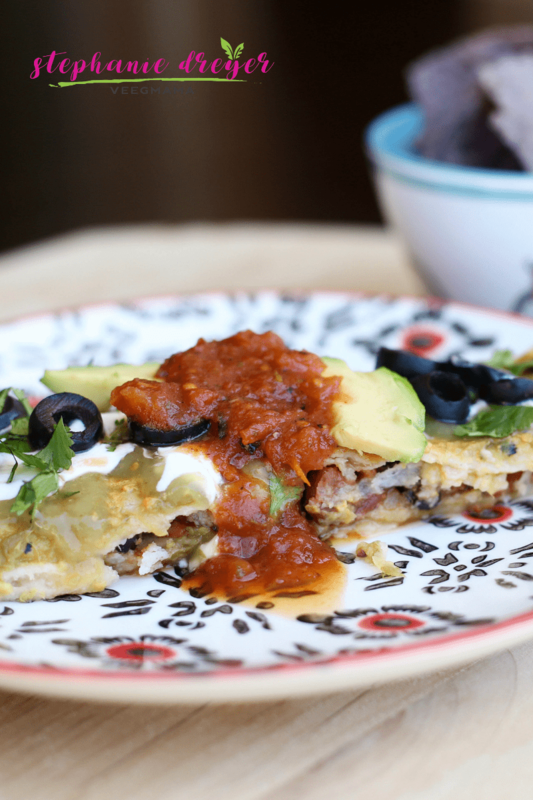 These Black Bean and Potato Enchiladas are my favorite Mexican food! 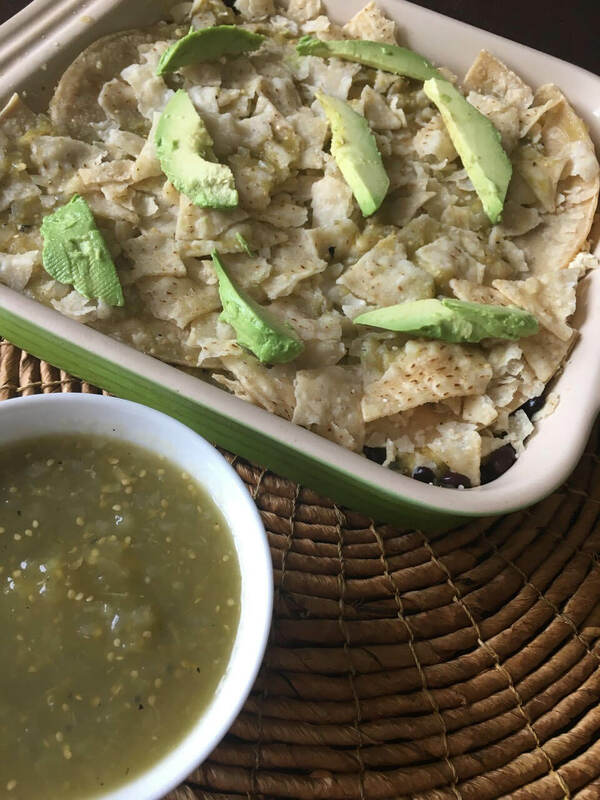 I love me some tacos, and tamale pie was a special treat as a kid, but these enchiladas are my comfort food. With both red and green sauces, they look especially festive for the holidays, but they’re tasty enough to eat all year long. 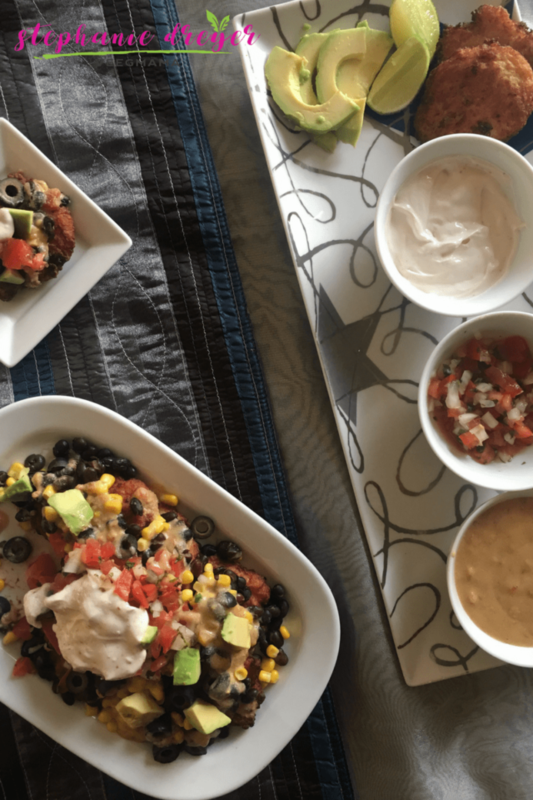 One of the reasons I love these black bean and potato enchiladas so much is that they use one of my favorite meal prep tips: Repurpose leftovers. That’s actually how this recipe originated. I had made roasted potatoes for dinner as a side dish one night and had tons leftover. 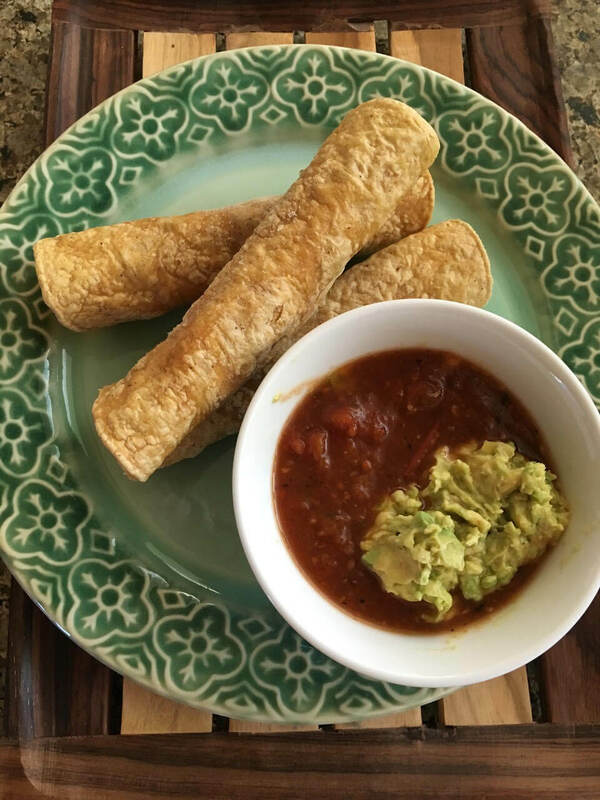 I jazzed up some canned beans and folded them into a batch of these enchiladas. The whole family loved them so much that I knew I had a winning recipe. I hope you and your family enjoys them! Place the potatoes on a baking sheet and toss with 1 tablespoon of olive oil, 1 teaspoon of salt and a ½ teaspoon of freshly ground pepper. Roast for 30 minutes. When potatoes are done cooking, empty the black beans and their liquid into a large skillet. Stir in the garlic, lemon juice, cumin, and salt. Add in the potatoes. Cook for about 10 minutes until all the liquid is absorbed. Coat the bottom of a casserole dish with the salsa verde. Heat the corn tortillas on each side until pliable (about 20-30 seconds). Take each one and spoon a heaping amount of filling into it and roll seam side down. Continue with all tortillas. Pour the enchilada sauce on top of the tortillas. Use a spoon to spread the sauce evenly across the enchiladas. Add the remaining salsa verde on top and swirl to combine. Bake for 20 minutes until heated through. Serve with more salsa verde, sliced avocado, lime wedges and chopped cilantro. Fall is here and I am loving the varieties of squash that greet me at my local Trader Joe’s. Just seeing those unique shaped beauties puts me in a fall state of mind. I didn’t particularly like squash when I was kid. I mean, it’s scary looking, and the texture can be off-putting to picky palates. 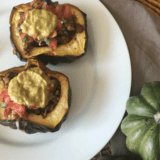 As an adult, however, I crave the comforting taste of a sweet and savory stuffed delicata squash or the fun “pasta” dinner made with spaghetti squash. 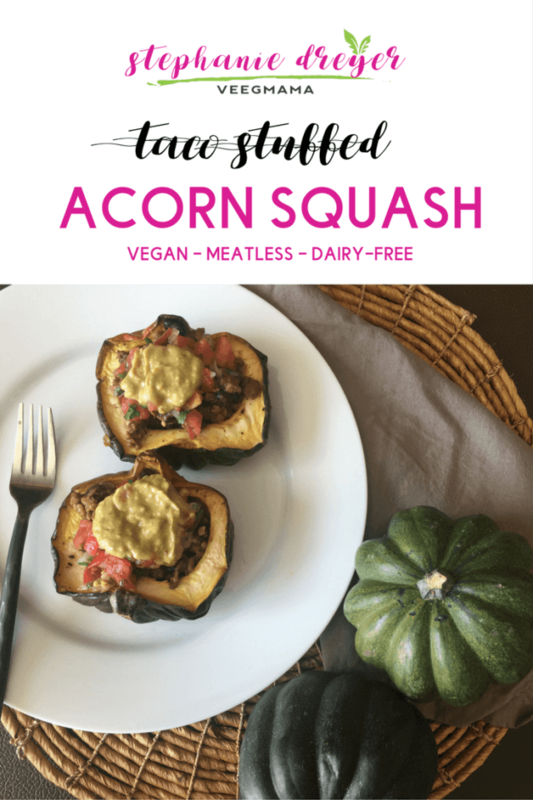 Acorn squash is one of my favorites. It is the perfect vessel for stuffing or turning into a “bowl” of some kind. 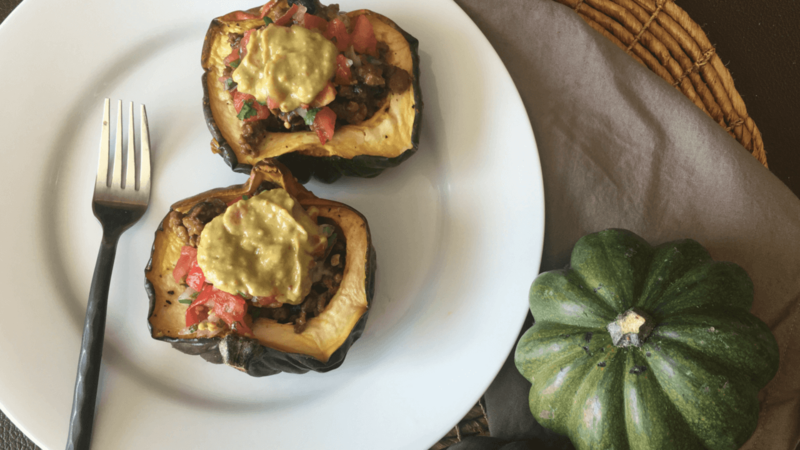 It’s subtle sweet flavor combines well with savory flavors, and is the star ingredient in a happy experiment that came to be this Taco Stuffed Acorn Squash recipe. I was making myself lunch last Wednesday and opened the fridge to find some baked squash that I had batch cooked over the weekend. Sitting next to it was some leftover taco filling from the night before. 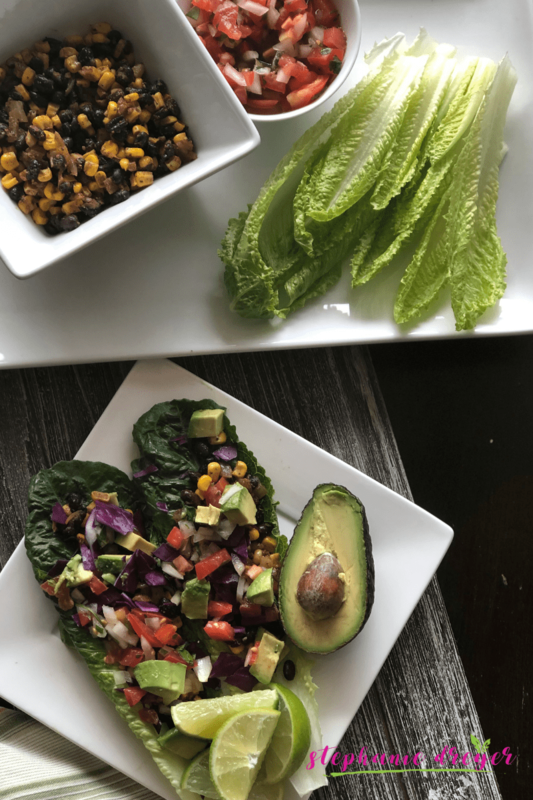 I added my homemade pico de gallo, and came up with a quick and easy smoky, chipotle avocado sauce…and lunch was served! This meal is very satisfying, but doesn’t leave you filling heavy. 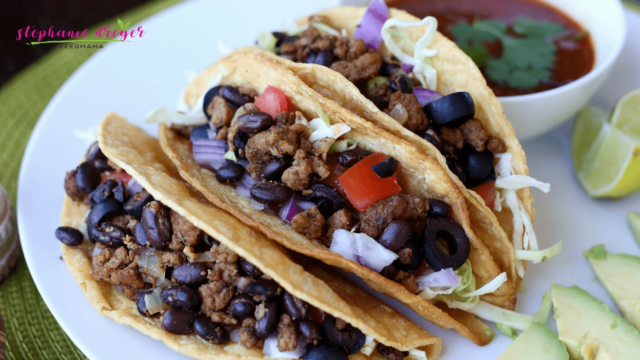 It is reminiscent of the flavors of Fall with the spicy taste of Taco Tuesday! I hope you’ll try it and let me know what you think. Heat the oven to 350 degrees. Drizzle each squash half with ¼ teaspoon of olive oil and season with salt and pepper. Place cut side up on a baking pan and roast 25-30 minutes, until tender. Set aside. While the squash roasts, heat the oil over medium heat. Add the onion. Saute for five minutes, until translucent. Add in the taco seasoning and water. Stir well to combine. Reduce to simmer and allow to simmer 10-15 minutes until the filling becomes thick and the water is cooked through. While the meat is cooking, prepare the pico de gallo. Combine all of the ingredients in a bowl and set aside. Place all of the ingredients for the Smoky Avocado Sauce in a food processor. Pulse on low until combined and creamy. Add salt to taste. 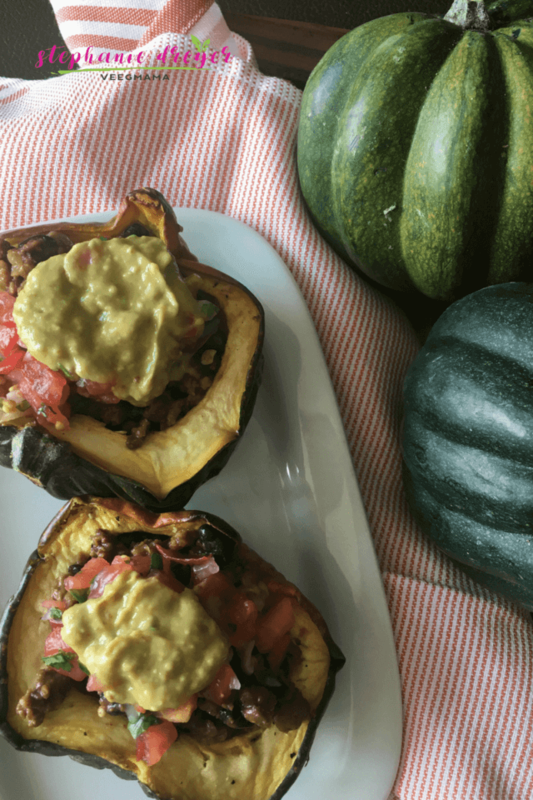 To assemble, scoop a generous amount of filling into the middle of each squash half. 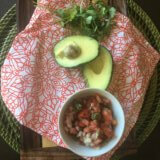 Top with the pico de gallo and a dollop or more of Smoky Avocado Sauce. 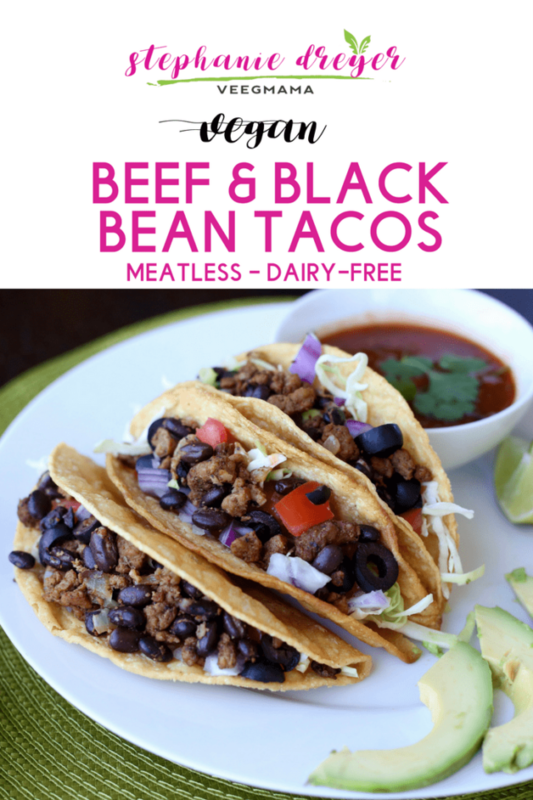 Beyond Meat Beefy Crumbles are one of my favorite plant-based products on the market (and I promise, they aren’t paying me for this post!). The texture is just like real beef and the flavor is fantastic. I make these tacos every week for my family and they never miss the real beef. 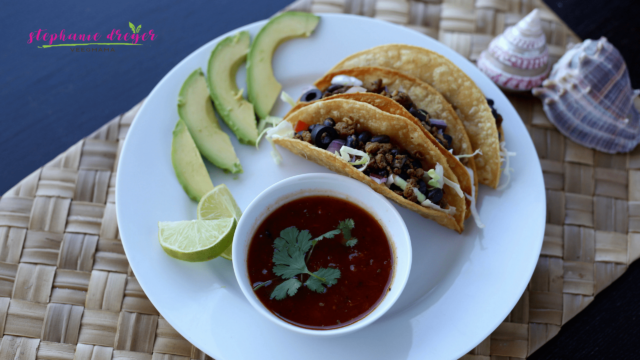 I love to serve these tacos topped with homemade pico de gallo and guacamole, (my son makes a delicious batch for us every week). They meat and bean mixture is scrumptious in a fried corn shell, but equally mouth-watering eaten in a crisp romaine leaf. 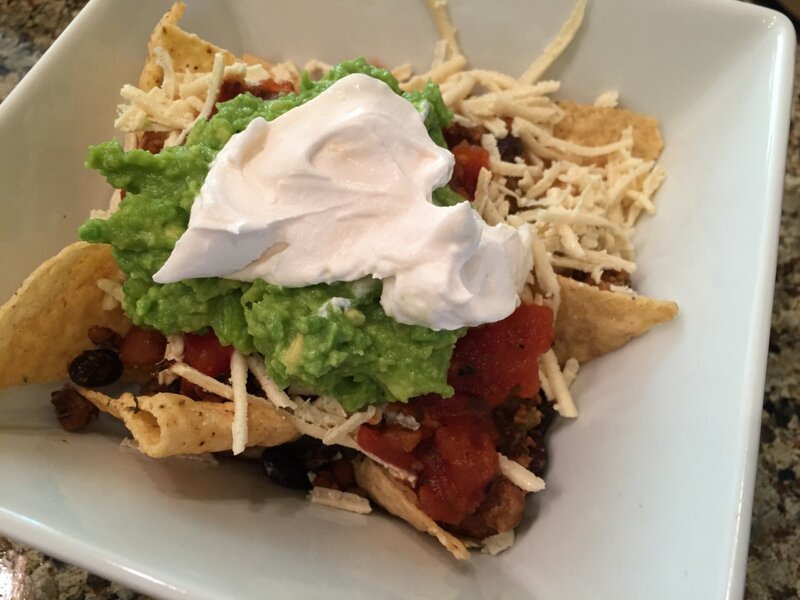 For more “meaty” recipes with Beyond Meat, check out my Beef Nachos, Beef and Cheese Taquitos, and Fiesta Dip. Heat olive oil in a saute pan and add onion. Cook about 5 minutes until softened. Add in the Beyond Beef Beefy Crumbles. Drain half the liquid from the can of black beans and stir them into the beef mixture along with the remaining liquid. Sprinkle in the seasoning and mix to combine. Stir in the water. 5.Simmer on low for about 10 minutes, or until the liquid is absorbed. 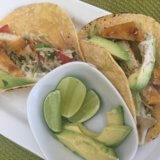 Serve warm inside corn tortilla shells, topped with your favorite taco fillings. This homemade pico de gallo is super easy (and fun to make with the kids). I made a batch for Taco Tuesday last week and it went really fast…made me wish I had doubled the recipe. There’s really nothing to it, just a few ingredients chopped up and mixed together. It’s best eaten the same day, but can keep if sealed in an airtight container for another day or so. It’s a great option for your arsenal of Cinco de Mayo recipes. Combine all ingredients in a bowl and stir well to combine. 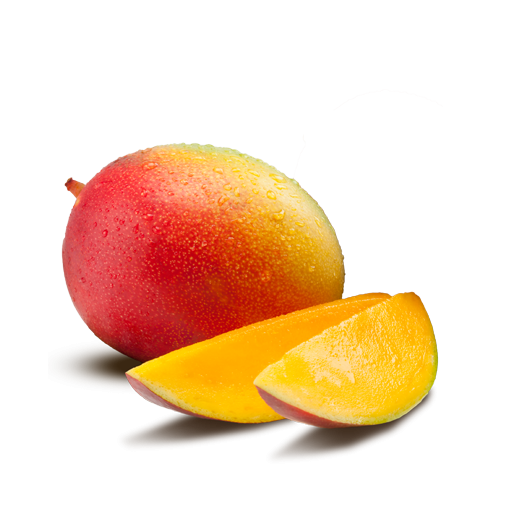 Taste and add more lime juice and salt, as needed. I recently discovered Gardein’s Golden Fishless Fillet and can’t believe how much it tastes like the real thing. Well done, Gardein, although I am not surprised as every product they put out is high quality and tastes delicious. I typically don’t eat these faux meat products often, but I will make an exception for these fillets! Not only are they eerily tasty, but they are also flaky and consistent from a texture perspective too. 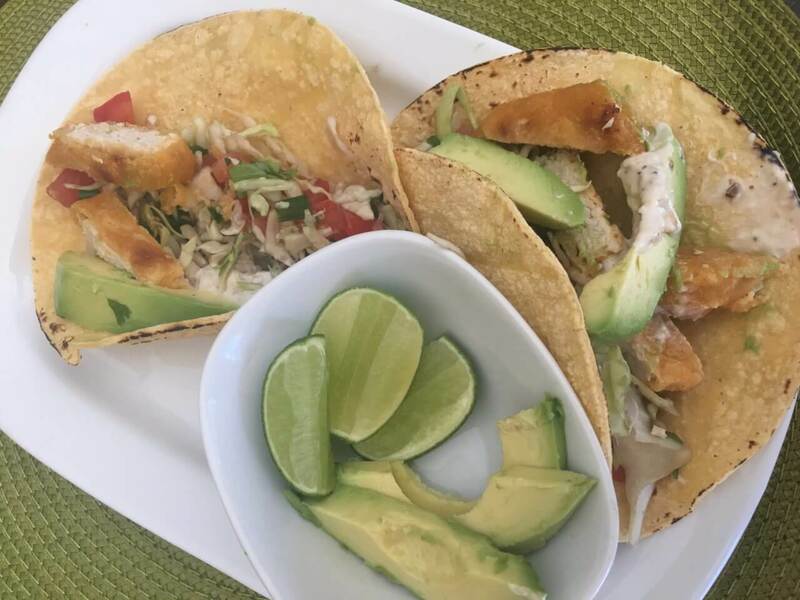 They’d make a great “fish and chips” dinner, but I decided to have some fun and turn them into tacos! Upon my discovery of these fishless fillets, I also discovered Follow Your Heart’s Tartar Sauce. Truth be told, I have been eyeing the jars of this sauce in my Whole Foods for months now, but didn’t have anywhere to use them…until now. 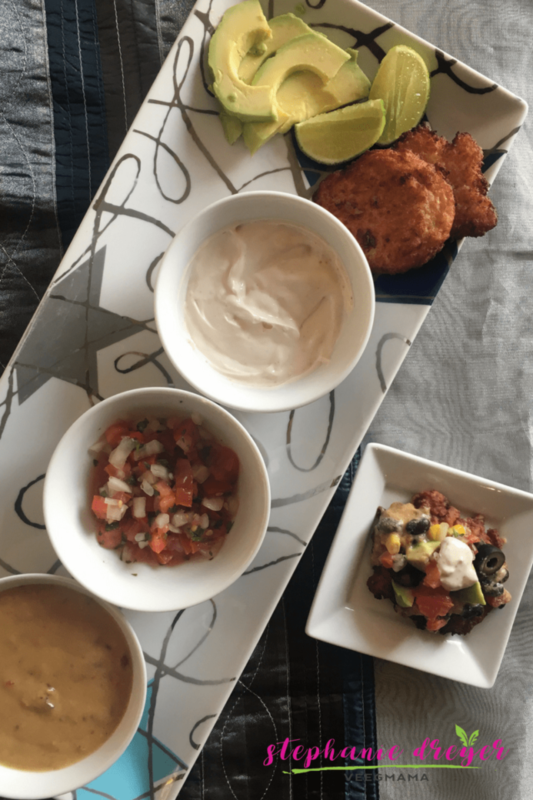 The creamy topping on these tacos is indeed, this tartar sauce. This recipe is so simple that I am not sure I can even call it a recipe. It’s really just opening a bunch of packages and jars, chopping, and then tossing them with a few things. 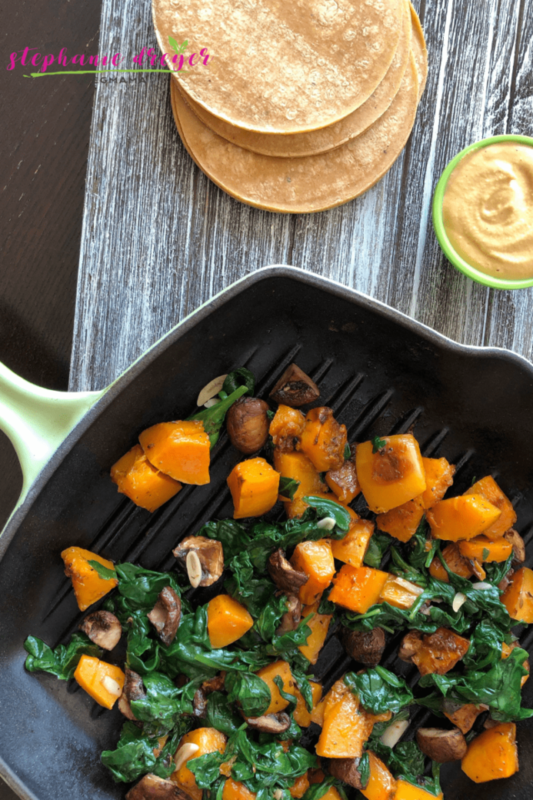 It’s a great meal solution for a busy weeknight after sports or activities and you only have about 30 minutes to get dinner on the table with no time to prep. 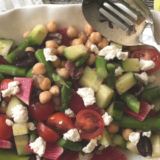 Try this recipe! Prepare Fishless Fillets according to package directions (bake 10-12 minutes at 425 degrees). While fillets bake, prepare the slaw: Toss the cabbage, carrots, green onions, tomato and the juice of 1 lime in a bowl. Sprinkle with salt and taste for seasonings. 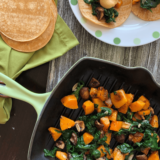 When fillets are ready, heat one tortilla at a time on a stove burner, until the tortilla becomes pliable. Chop the fillets into small pieces. Spoon some of the slaw into each tortilla with about half of one fillet. Add in a few avocado slices, and top with a dollop of the tartar sauce. *For guacamole (mash 2-3 avocados with juice of 1 lime and salt to taste. Spread the refried beans into an 8×8 glass or ceramic baking dish. Sprinkle the Fiesta Ground “Beef” on top of the beans. Layer the guacamole, and then the sour cream on top of the “beef. Add the tomatoes in another layer, followed by the black olives. 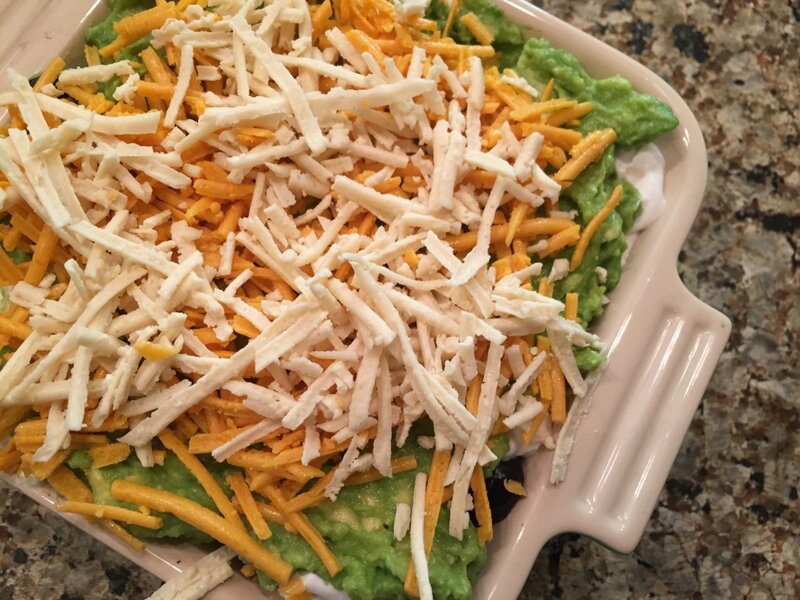 Sprinkle the cheese over the top in one single layer. Bake at 350 degrees for 10-15 minutes until the cheese is melted and the dip is heated all the way through. Serve immediately with tortilla chips. Heat broth in a saute pan and add onion. Cook 5 minutes until softened. Add the beans and taco seasoning. Stir to combine and cook 4 minutes until heated through. Set aside. 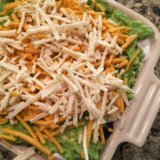 Scoop the chips into a microwave safe bowl. Sprinkle 1/4 cup of the bean mixture and Fiesta Ground “Beef” on top of the chips. Add cheese and microwave about 1 minute until the cheese is melted. 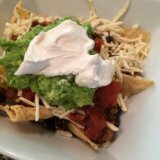 Top with the sour cream, salsa, and guacamole. Vegan bowl with BBQ tofu, quinoa, and a rainbow of vegetables, topped with BBQ sauce and a vegan peppercorn ranch dressing. My family loves Mexican food. Taco Tuesdays are a tradition every week in my household, and burritos and tacos make it on our breakfast and lunch menu at least once a week. Because I always cook more food than anyone can eat, I typically have leftover taco filling from Tuesday night that I eat the rest of the week in vegan taco bowls or the breakfast burritos I mention above. his chilaquile breakfast casserole is going to delight your family on New Year’s morning! Chilaquiles are a traditional Mexican dish. It is prepared by frying corn tortillas cut into triangles as the base of the recipe, and then topped with green or red salsa. The mixture is then simmered and topped with crema, queso fresco, onion, and avocado. 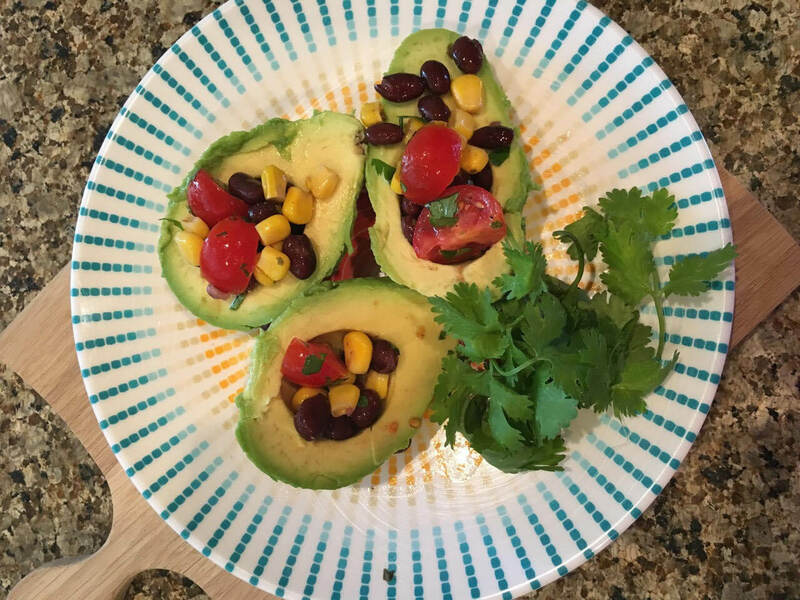 Would it surprise you to know that I eat an avocado just about every day? Chopped on top of a salad, sliced in a wrap, or mashed as guacamole, I crave avocado daily. It is a bit of a comfort food for me, and with all the “good fat” it contains, I try not to feel guilty about eating it! 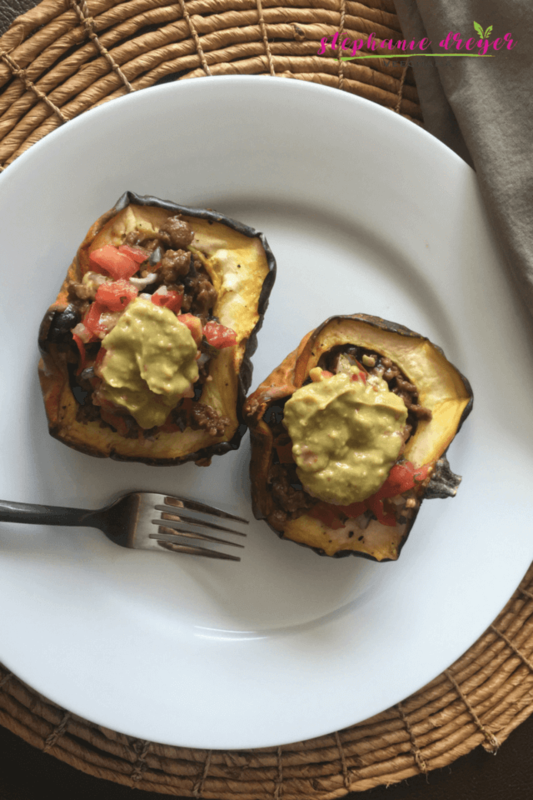 Today, I add a new way to eat my avos – stuffed! A stuffed avocado, you ask? Yes, it’s delicious. You will love it! 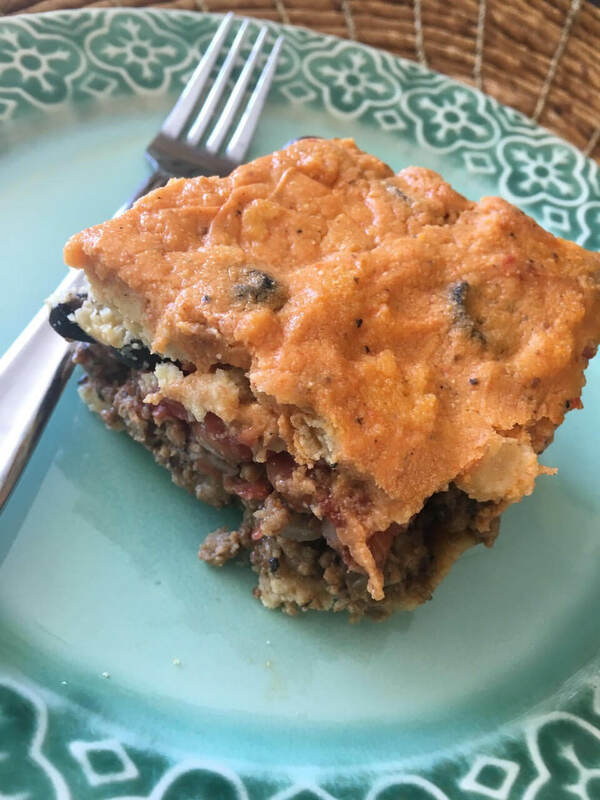 This tamale pie recipe takes me way back. I have been craving my mom’s old recipes, the ones she made when I was kid. My mom’s cooking was comfort and love when I was a girl, and still is even now at forty-one with kids of my own to love and comfort! I watched her, mesmerized as her hands got to work in the kitchen.